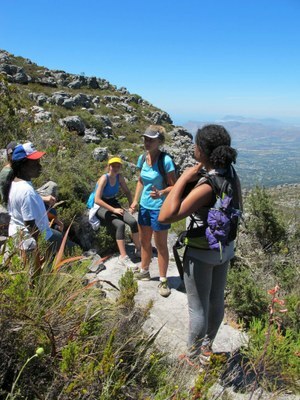 On Sunday the 22 January a group of twenty Rhenishers went on a CHAOS (Camping Hiking and Outdoor Society) hike up Table Mountain. Bright and early (for a weekend), CHAOS faced Table Mountain as the group of Rhenishers set out on what we expected to be a walk, but discovered within a few minutes was going to be quite a climb! Throughout the day and especially during our prolonged water breaks, we were given the opportunity to socialise and get to know our fellow climbers and Rhenish sisters in other grades. In true Rhenish spirit, girls were eating snacks along the way and were always willing to share. While hiking we were amazed by the friendliness of passing hikers as well as the jaw-droppingly incredible view. This is definitely a must do hike. Although it is strenuous, it is definitely worth it. Watch out for the announcement of our next hike and join CHAOS on our next adventure.